Background and Purpose: The current study aims to evaluate the effect of the fruit size of service tree (Sorbus domestica L.) on physio-morphological properties of seeds and the seed germination process. Materials and Methods: The fruit samples varying in size and divided on the basis of weight into small (5-10 g), medium (11-15 g) and large (16-20 g) were collected from the area of Vukomeričke gorice (45°34′45″N 16°00′11″E), Zagreb County, Croatia. Results: In all fruits, a significant, positive and very high correlation was found between the fruit length and width (r=0.92). There was a negative and significant correlation between the fruit weight and the fruit shape index (r=-0.47). The number of filled seeds in fruit was significantly higher in large fruits (2.62 seeds) than in medium and small fruits (1.81 and 1.46, respectively). Seeds from large fruits had significantly greater length of radicle (3.89 mm) than those from medium and small fruits (3.27 and 2.88, respectively) after 120 days of stratification at 3°C. The mean germination time of seeds for all fruits in total was 107 days. The seeds with the highest weight had significantly lower rate of moisture absorption. After stratification the seeds of large fruits had the highest germination percentage (83.7%). Conclusions: The findings obtained will likely impact the propagation of this plant species in the future, because the results of the study favour the usage of seeds obtained from large fruits since they showed highest germination rate. Keywords: Fruit morphology, radicle emergence, seed germination, stratification, Sorbus domestica L.
Service tree (Sorbus domestica L.) is a rare wild tree with deciduous nature, 15-20 (rarely 30) m tall with broad, roundish ovoid crown that has the diameter of up to 100 cm (Figure 1). Service tree grows slowly (except in the juvenile period), reaches the age of 200-300 years and prefers warm and mild climate. It does not require any specific soil properties, but it grows well on deep and fertile soils. It can withstand drought, but is sensitive to late spring frosts . In a forest ecosystem, the ecological significance of this tree is great due to the forage (fruits) which it offers to wildlife species. Furthermore, its timber is valuable due to its excellent aesthetic and technical characteristics . FIGURE 1. 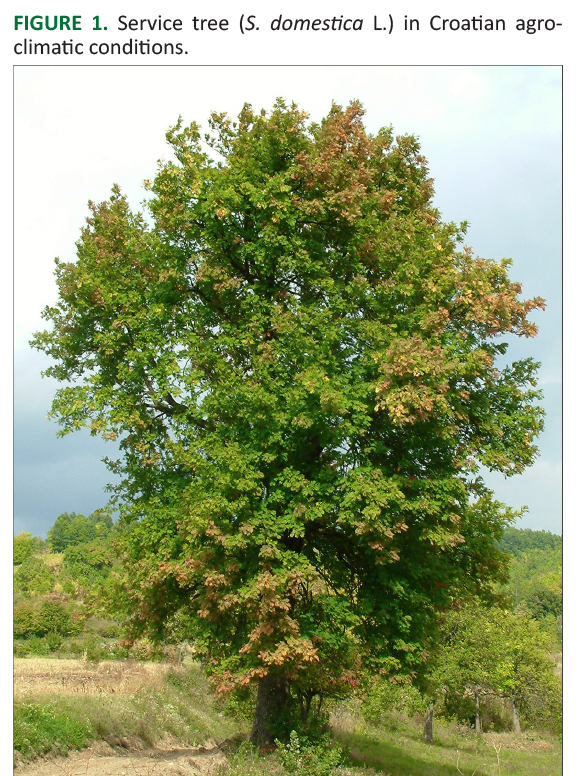 Service tree (S. domestica L.) in Croatian agro-climatic conditions. It is hard to determine the exact boundaries of natural expansion of service tree because it has been planted and expanded sub-spontaneously since ancient times. It is distributed either patchy or densely in southern and central Europe, northern Africa, Crimea and Asia Minor. However, the Balkan Peninsula, the Apennine Peninsula and southern France are considered as the main area of its cultivation. Nevertheless, S. domestica is very rare and threatened in many European countries . Croatia is one of the countries where the environmental conditions favor the cultivation of service tree. This species is extensively found in the Mediterranean area, as well as in the continental part of Croatia . Service tree fruit is edible, apple- or pear-shaped, with a diameter of about 1.5 to 3 cm, yellow-reddish or yellowish with brown spots. In the wild, service tree propagates itself by seed, especially within its natural range . It flowers in March while its fruit ripens from August to September . According to Drvodelić et al. , the good yield of service tree in Croatia happens in intervals of every four years. Whereas, according to Kausch-Blecken von Schmeling , service tree yields highly every two to three years. The reason behind such differences can be justified with a fact that when service tree yields highly it spends a lot of energy for the growth of fruits and seeds and therefore it is not strange that there are big intervals between the years of high yields. Service tree produces more seeds when it is cross-pollinated. Allogamy is possible if the distance between the trees is not more than 800 m .
Fresh seeds from the species of genus Sorbus L. do not germinate easily and need low temperatures under moist conditions (stratification) . Numerous studies mentioned that fresh Sorbus spp. seeds do not germinate immediately after maturation because they need longer period with cold stratification [11-14]. Moreover, as per rules of International Seed Testing Association (ISTA) , before the testing of seed germination it is necessary to keep the seeds in cold stratification for 4 months at a temperature ranging from 3 to 5oC. However, Winkler  found that the seeds of service tree and wild service tree need stratification conditions, that they germinate well in darkness and should be mixed with appropriate substrates, as well as kept in refrigerator at a temperature from 0oC to 4oC. Temperatures lower than 0oC are not favorable because they freeze down the water that further stops seeds to swell. Moreover, the seeds should be stratified at the beginning of December. Kausch-Blecken von Schmeling  found that it is very important to rinse the mesocarp of fruits properly to avoid the occurrence of mold during the storage of seeds. Likewise, Meier-Dinkel  suggested that two and a half months before sowing, the seeds should be placed on moist sand in a covered jar and kept in the refrigerator at 4oC where some seeds can germinate at the end of stratification. After stratification, the seeds should be kept on a warm place (20oC) where after a few days they start to germinate. However, Pipinis et al. suggested a 3-month period of stratification at 3-5oC since this is essential for breaking dormancy in the seeds of S. domestica. Service trees have double dormant seeds due to undeveloped seed embryo and an impermeable seed coat . Surprisingly, very little work has been done so far regarding the morphological studies of service tree fruit and the impact of the fruit size on the physiological properties of seeds. Henceforth, the current study was conducted to determine the morphological characteristics of service tree fruits of different weight and their correlations with physical properties of seeds. In addition, the aim was also to test the laboratory seed germination of fruits of various weight after 120 days of stratification. The fruits of service tree were collected in the area of Vukomeričke gorice (45°34′45″N 16°00′11″E), Zagreb County, Croatia, in autumn when fruit ripens. A total of 150 fruits were collected from 10 trees for the analysis and were grouped on the basis of weight as small (5-10 g), medium (11-15 g) and large (16-20 g). The length (mm) and width (mm) of fruits were measured using digital caliper, while fruit weight was measured with laboratory balance (accuracy 0.01 g). The seeds were manually extracted from fruits with the help of a little knife and then the number of filled seeds in every fruit was recorded. After the seeds were air-dried, the weight of each seed (309 seeds from 150 fruits) was measured. The seeds were then stratified. The seeds were moistened and placed on an absorbing filter paper before they were used for stratification. Every seed was coded for recognition of its origin and placed on moistened filter paper covered with another layer of moistened filter paper to avoid draining. Stratification was carried out at a temperature of 3oC and lasted in total for 120 days in accordance with rules of ISTA for overcoming seed dormancy from species of the genus Sorbus. The moistening of the filter paper was continued as per need during stratification time. After 120 days, at the end of stratification period, the weight of each seed was measured to calculate the percentage of moisture absorption. The daily monitoring of seeds was performed in order to record the time of seed shell bursting and radicle emergence (Figure 2) up to the length of 2 mm during entire stratification period. The increase in length after radicle cracking was measured on a daily basis using digital caliper. The radicle length after 120 days of stratification is described in detail in the current study. The statistical analysis was performed with statistical package SAS 9.2 using ANOVA and correlation analysis. The means were compared using LSD test at p≤0.05. FIGURE 2. 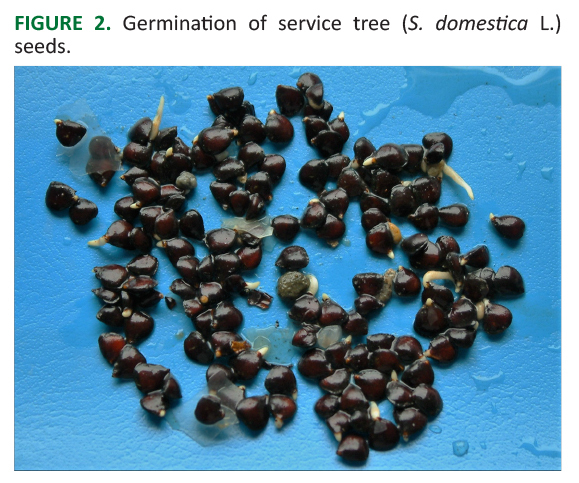 Germination of service tree (S. domestica L.) seeds. The descriptive statistical data of some morphological characteristics of service tree fruits with different weight is shown in Table 1. Statistically significant differences were determined in length (mm) and width (mm) of the fruits between groups defined by weight (p≤0.0001). Small fruits showed statistically significant difference (p≤0.0001) having the highest fruit shape index (0.98) in comparison with medium (0.94) and large (0.91) fruits. Therefore, it can be concluded that small fruits had a more round shape. A number of filled seeds in S. domestica L. fruits were statistically significant (p≤0.0001) and higher in large fruits (2.62 seeds) in comparison with medium (1.81 seeds) and small (1.46 seeds) fruits (Figure 3). TABLE 1. Descriptive statistics of some morphological traits of service tree (S. domestica L.) fruits of different sizes. FIGURE 3. 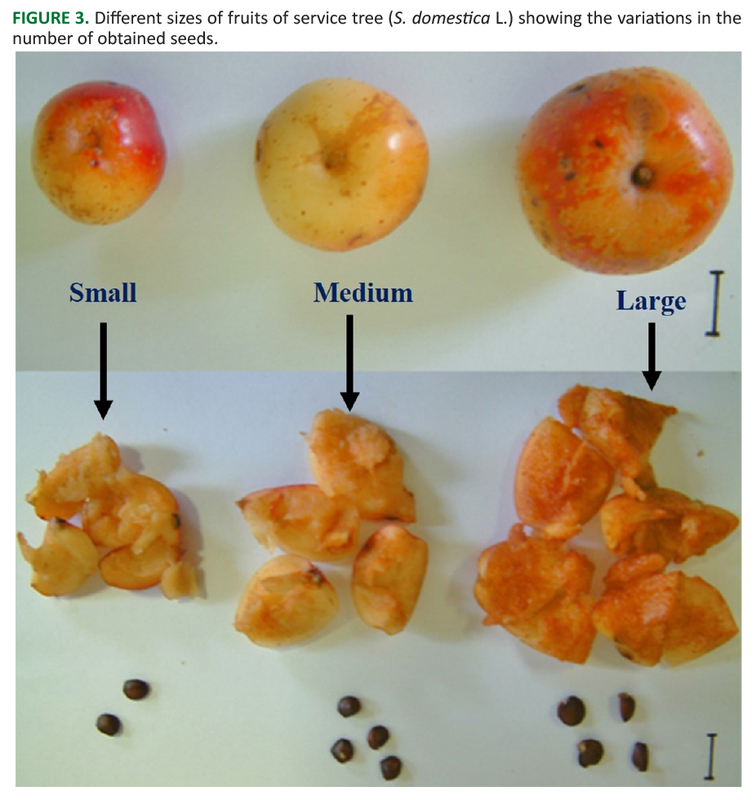 Different sizes of fruits of service tree (S. domestica L.) showing the variations in the number of obtained seeds. Regarding all fruits in total, a positive and very high correlation was found between fruit length and width (r=0.92), fruit length and weight (r=0.93) and fruit width and weight (r=0.98). Statistically significant (p≤0.0001) correlations were found between the number of filled seeds per fruit and fruit length (r=0.42), fruit width (r=0.50), fruit shape index (r=-0.36) and fruit weight (r=0.50). There was a negative and statistically significant correlation between fruit weight and fruit shape index (r=-0.47) (Table 2). TABLE 2. Correlation coefficients for the morphological traits of service tree (S. domestica L.) fruits (all sizes combined together). Within small fruits, a positive and very high correlation was obtained between fruit length and width (r=0.80), fruit length and weight (r=0.87) and fruit width and weight (r=0.96). Statistically significant (p≤0.05) negative correlation was found between the fruit shape index and the number of filled seeds in fruits (r=-0.29) (Table 3). TABLE 3. Correlation coefficients for some morphological traits evaluated on service tree (Sorbus domestica L.) fruits of diferent sizes. Within medium fruits, a positive and high correlation was obtained between fruit width and weight (r=0.75) with statistically significant difference at p≤0.001. Statistically significant (p≤0.01) correlation was also found between fruit length and weight (r=0.48) and between fruit width and the number of filled seeds per fruit (p≤0.05, r=0.41) (Table 3). In the case of large fruits, a positive and very high correlation was obtained between fruit width and weight (r=0.94). Statistically significant (p≤0.001) difference was found between fruit length and width (r=0.53) and between fruit length and weight (r=0.68). Less positive, but statistically significant (p≤0.05) correlation was obtained between the number of filled seeds in fruit and fruit width (r=0.30) and fruit weight (r=0.23) (Table 3). There are several reports available worldwide mentioning the fruit morphological characteristics of service tree but with little variations. Ballian et al. stated that the service tree fruit length was between 17.5 and 35.1 mm, and its width between 15.5 and 24.9 mm. Whereas, according to Miko and Gažo , the average fruit width was between 21.4 and 27.2 mm which varied between 17 and 39 mm, and the average length between 23.1 and 32.3 mm which varied between 20 and 37 mm. Furthermore, the fruit weight was between 7.4 and 21.0 g which varied between 4.3 and 22.3 g. Similarly, Májovský  when mentioning the botanic description of service tree reported that fruit width was between 21.4 and 27.7 mm, fruit length between 15.0 and 30.0 mm and fruit weight between 20 to 30 g. However, according to Brindza et al. , average fruit length was between 19.84 and 36.29 mm and width between 18.9 and 32.58 mm. while the average weight was from 4.91 to 18.64 g. The reasons behind such variations might be, as Kárpáti  found in his studies, due to the fact that service tree fruits with diameter bigger than 1.5 cm are the result of selection. It is interesting to mention a research conducted by Végvári  in Hungary who reported that service tree fruits that have different color (yellow, red, brown) also differ in shape. Whereas, according to the findings of Drvodelić et al. , who conducted extensive studies on service tree in different parts of Croatia, the average length of fruit was between 22.05 mm (Ogulin) and 25.66 mm (Novi Vinodolski), average width between 24.55 mm (Ogulin) and 27.30 mm (Novi Vinodolski), and average weight of fruit from 8.75 g (Ogulin) to 11.23 g (Novi Vinodolski). In addition, the fruit weight in 2003 was between 3.42 and 17.24 g or on average 7.92 g, in 2004 between 4.65 and 12.20 g or on average 8.37 g, in 2005 between 7.14 and 11.36 g or on average 9.29 g, in 2006 between 6.69 and 10.49 g or on average 8.72 g, and in 2007 between 8.35 and 12.98 g or on average 10.01 g. He further stated that in comparison with the sites from which the samples were taken in Republic of Croatia during five years of research (2003-2007), the average fruit weight of service tree increased from western to eastern parts of the country. As per findings of Ballian et al. , the differences between trees are mostly contributed by fruit length of service tree and the genotypes that have large fruits and thus should be used for propagation. According to Drvodelić , the service tree fruit’s width and length features are more similar between geographically closer sites, such as Nova Kapela and Ogulin, or Rab and Novi Vinodolski in Croatia. He found that the average index of length/width of fruits for all five years he studied was 0.92 for Novi Vinodolski site, 0.97 for Ogulin site, 0.99 for Rab site and 1.03 for Nova Kapela site. He also found that the highest range of length/width index was achieved in year 2006 (0.79-1.61), while in other years that range was more or less equal. Our findings are more or less similar in comparison to the above-mentioned studies, since the average length of small fruits was 23.19 mm, of medium 27.45 mm and of large 29.93 mm. Similarly, the average width of small fruits was 23.81 mm, of medium it was 29.31 mm and of large 32.67 mm. Moreover, the fruit shape index varied from 0.91 to 0.98, which coincides with the previous studies conducted by Drvodelić et al. and Drvodelić . The findings obtained in our study regarding the average fruit weight between 7.67 and 18.83 g are different than the results by Miko and Gažo  who reported higher fruit weight of service tree in Slovakia than in Croatia. Similarly, the fruit weight in the study reported by Májovský  is much higher than in our research. In addition, Drvodelić et al. reported positive and high correlation between fruit length and width (r=0.73), fruit length and weight (r=0.87) and fruit width and weight (r=0.93) that corresponds with the results obtained in the current study. Regarding the number of seeds in fruits of service tree in different sites of Croatia, Oršanić et al. reported that in 2003 it was from 1.35 (Rab) to 2.70 seeds (Nova Kapela) and on average 1.94 seeds. In 2004 the number of filled seeds in fruit were between 1.45 (Novi Vinodolski) and 2.26 seeds (Nova Kapela) and on average 1.74 seeds. On the contrary, Drvodelić et al. reported that the average number of filled seeds in fruits of service tree in different parts of Croatia was from 1.80 (Ogulin) to 3.53 (Novi Vinodolski). In addition, Drvodelić  reported that the number of filled seeds in service tree fruit (2003-2007) increases from western to eastern parts of Croatia. Regarding the findings obtained in the current study, the number of filled seeds in fruits ranged from 1.46 for small fruits to 2.62 for large fruits. On average, there were 1.96 seeds in fruit, which is in accordance with research conducted by Oršanić et al. .
Frehner and Fürst  reported that the average number of service tree seeds in 1 kg varied between 40,000 and 55,000 seeds. In our case, the average number of air-dried seeds in 1 kg ranged between the examined groups from 25,126 seeds to 35,336 seeds, which is lower than what was reported by Frehner and Fürst . Statistically significant difference between large fruits and between medium and small fruits (p≤0.001) was obtained in terms of length of seed radicle after 120 days of stratification. Seeds from large fruits had significantly higher length of radicle (3.89 mm) than the seeds from small (2.88 mm) and medium (3.27 mm) fruits. Considering the percentage of moisture absorption after 120 days of stratification, no significant difference was found between seeds from the examined groups (p=0.2896). The weight of one air-dried seed significantly differed between the examined groups (p≤0.001). It was noticed that seed weight increased with fruit weight. No statistically significant difference was found in mean germination time (MGT) between the examined groups, even though the seeds from large fruits germinated four days earlier than the seeds from medium fruits, and three days earlier than the seeds from small fruits. Mean germination time for seeds regarding all fruits in total was in average 107 days (Table 4). TABLE 4.Descriptive statistics of some morphological and physiological traits of seeds from service tree (S. domestica L.) fruits of different sizes. For seeds from all fruits negative significant correlation (r=-0.66) was obtained between length of radicle after 120 days of stratification and the time needed for the beginning of germination. Other correlations were also statistically significant (p≤0.001). Negative and weak correlation was found between the percentage of moisture absorption after 120 days of stratification and the time needed for the beginning of germination (r=-0.40) and seed weight in air-dried condition (r=-0.22). It can be concluded that by increasing seed weight in air-dried condition, the percentage of moisture absorption was statistically and significantly decreasing. The correlation between radicle length after 120 days of stratification and seed weight in air-dried condition was positive and small (r=0.26) (Table 5). TABLE 5. Correlation coefficients for the morphological and physiological traits of seeds from service tree (Sorbus domestica L.) fruits (all sizes combined together). In the case of seeds from small fruits a positive and statistically significant (p≤0.05) correlation was obtained between radicle length after 120 days of stratification and the percentage of moisture absorption (r=0.46). Negative and significant correlation (r=-0.48) was obtained between radicle length after 120 days of stratification and the time needed for the beginning of seed germination, as well as between the percentage of moisture absorption and seed weight in air-dried condition (r=-0.32). Negative and weak (r=-0.39) but statistically significant (p≤0.01) correlation was obtained also between the percentage of moisture absorption and the time needed for the beginning of seed germination (Table 6). For seeds from medium and large fruits a negative and significant (r=-0.49) correlation was obtained between the length of radicle after 120 days of stratification and the time needed for seed germination, as well as between the percentage of moisture absorption after 120 days of stratification and the time needed for the beginning of seed germination (r=-0.33). The difference between the above-mentioned parameters was significant at p≤0.01. Although negative and small, but statistically significant (p≤0.001), the correlation was obtained between the percentage of moisture absorption after 120 days of stratification and seed weight in air-dried condition (r=-0.32) (Table 6). TABLE 6. Correlation coefficients for some morphological and physiological traits of seeds from service tree (S. domestica L.) fruits of different sizes. For seeds from large fruits, negative and high correlation was obtained between radicle length after 120 days of stratification and the time needed for seed germination (r=-0.79). Correlation between the percentage of moisture absorption and the time needed for seed germination was negative and significant (r=-0.45). The difference between the above-mentioned parameters was significant at p≤0.001. There is positive and small, but statistically significant (p≤0.01) correlation between radicle length after 120 days of stratification and the percentage of moisture absorption after 120 days of stratification (r=0.29), and negative and small correlation between the percentage of moisture absorption after 120 days of stratification and seed weight in air-dried condition (r=-0.26) (Table 6). After 120 days of stratification the seeds from the group of large fruits (16-20 g) had the highest percentage of germination (83.7%). With the help of Chi-squared test statistically significant difference (p≤0.001) was found between the examined groups in germination of seeds from fruits with different weight, wherein seed germination in the group of large fruits was significantly higher than seed germination in groups of medium (59.4%) and small (56.2%) fruits. 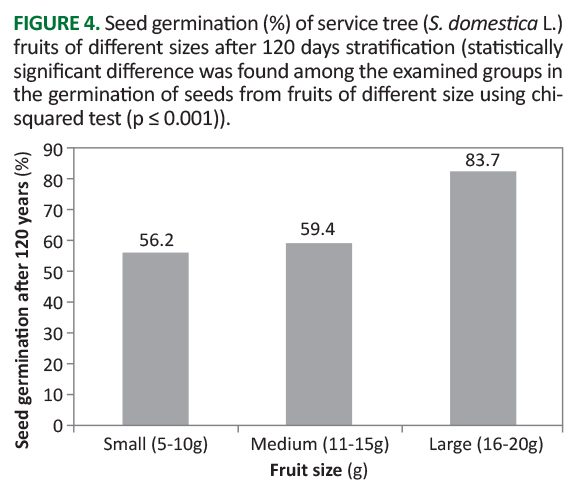 It can be concluded that seed germination of service tree in controlled conditions increased from the group of small to the group of large fruits (Figure 4). FIGURE 4. Seed germination (%) of service tree (S. domestica L.) fruits of different sizes after 120 days stratification (statistically significant difference was found among the examined groups in the germination of seeds from fruits of different size using chi-squared test (p ≤ 0.001)). According to Lenartowicz , the seeds from the species of the genus Sorbus L. have problems with germination, which could indicate relatively high dormancy of embryo. It is one of the mechanisms by which embryos created by self-pollination and by inbreeding could be eliminated. According to Paganová , service tree seeds’ low temperature and high humidity stratification needs to be longer than 8 weeks to germinate (depending on year). Piagnani and Bassi  reported that for overcoming seed dormancy from the species of the genius Sorbus L. cold and moist stratification is needed in the period of 3 to 9 months. On the other hand, Drvodelić  found that only 105 days of stratification (15 days less than as suggested by ISTA ) was needed for overcoming double seed dormancy from four species of the genus Sorbus L. in Croatia. It can completely coincide with the results from the current study where mean germination time regarding all fruits in total was 107 days. Powell and Matthews  reported the methodology according to which the appearance of radicle was defined as RE (radicle emergence) and mean germination time (MGT). As per findings of Drvodelić , the average service tree seed germination rate at the end of stratification period in 2003 was 9.3%, in 2004 15.4%, in 2005 31.2%, in 2006 53.7% and in 2007 only 3.8%. Average service tree seed germination at the end of stratification period (120 days) for all five years of research (2003-2007) was 22.5%. He also reported that it is important to mention that in the years with the highest yield (2003 and 2007) the highest seed germination rate was not achieved at the end of stratification time. That means that the quality of yield does not have effect on the time needed for overcoming seed dormancy in this species. In our study we obtained much higher seed germination rate after 120 days of stratification, wherein seed from large fruits had germination percentage of even 83.7%. The findings obtained in this study will likely impact the propagation of service tree in the future. The obtained results suggest using the seeds obtained from large fruits because they had higher number of filled seeds per fruit and showed highest germination rate, as well as earlier germination in comparison to the seeds from medium and small fruits. After 120 days of stratification, the seeds from large fruits (16-20 g) had the highest percentage of germination (83.7%). Although no statistically significant difference was found in mean germination time (MGT) between the examined groups defined by weight, the seeds from larger fruits have germinated four days earlier than seeds from medium fruits and three days earlier than seeds from small fruits. This means that only large fruits should be used for propagation of service tree.